Lawrence of Arabia is a phenomenal epic. As I watched this sprawling film I wondered if it had been made today how it would be different. As with many of the movies on this list Lawrence of Arabia enjoys a massive run time. Of the six cuts of the film the shortest is over three hours and the longest adds more than half an hour. It’s likely that if it were released today it wouldn’t have been allowed this considerable length. 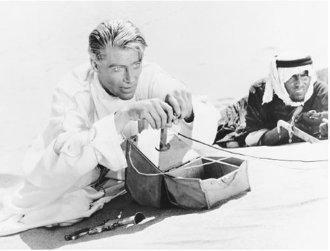 Viewed through the eyes of a modern day film fan, Lawrence of Arabia appears to have poor film economy as shots that would often be cut from today are allowed to play out. Sequences that would be shortened via times shifts in the edit are shown in full length so as to give the viewer the feelings of tedium, scale, and fatigue which the characters are experience. The film has an all-male cast of characters. If it were made today there would be some great fictionalizing to assure that there were equal representation of the sexes. Likely the reporter who covered Lawrence would be made into woman. Though not a love interest, because if it were made today then then rumors of Lawrence’s sexual orientation would’ve made them play up that supposed aspect of his life. Also most of the film’s violence is rather muted. With a few notable (and there fore more impacting) exceptions, very little blood is seen and never do we see a person getting shot or stabbed up close and in many cases we don’t see it at all. If this film were made today there is no doubt that it would’ve been a hard R with realistic violence. I would actually point to this film as an argument for making war movies less violent while still making them great. The film was also made during a time when wide shots were a sign of production value. Small budget movies can’t afford to shoot on location, pay crowds of extras, or build large set pieces, but today many large budget films still choose to focus on the performance rather than scenery by using long lenses to focus on the actors. This was no the case for Lawrence of Arabia; even many moments that were more intimate were shot in medium shot, while shots that would be shot in medium today are shot in wide, and shots that might require wide today are ultra wide in this film. Not every change would be negative. If it were shot today they would likely actually shoot the night scenes at night. In the 60s, even in large budget pictures they would shoot day for night whenever they could and it’s painfully obvious in this movie – which is otherwise a gorgeous film. It’s obvious that they’ve simply filtered the camera lens because of the shadows – the shadows wouldn’t be so harsh after sunset in reality. Also if it were shot today all (or at least most) the parts would played by people of the appropriate race. In the film as it sits the majority of the Arab people depicted were played by well-known British and American actors wearing makeup. While Hollywood still gets accused of “white washing” it’s usually done in fiction where the character’s race is changed for the sake of casting – in films based on true events it is increasingly rare to see any race depicted by a person who isn’t of that race. The film is beautiful and compelling. Perhaps most interesting is to read the many historical discrepancies that made the film controversial at the time. Though at the very least it is interesting to consider that at a time when the west was still largely considered the great, white hope this film dared to depict the west as largely treacherous; as they scheme to take control of the Arab empire after using their armies to conquer the Turks. Though, admittedly the hero is a white dude, though in this case it seems that has the benefit of being true.